I am hoping to host my first jamberry nails party next month as my friend is a rep. Excited to try them out. Those turned out so cute! I need to give my nails a good chevron look! I think Jamberry nails are super cute. I love them. LOVE Them! I just am now getting into doing my nails, I am going to have to check these wraps out! That’s really cute! I’ve been on a big chevron kick lately. I have been hearing so much about these nail wraps lately. I have been meaning to check them out. Super cute. I just did my toes with Jamberry and just love them! I love these colors, and the chevron design is really cool. I’ve heard of nail wraps before, but now I’ think I’ll have to look into it seriously. It’s so cool! 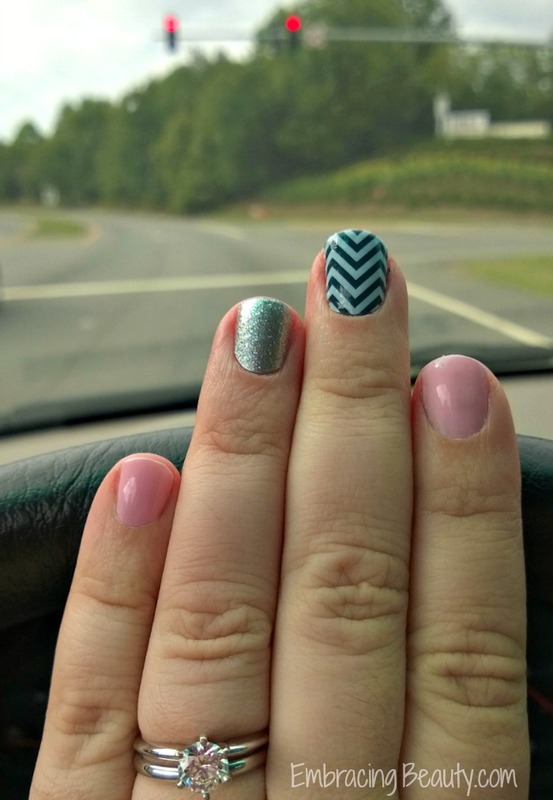 I’ve been hearing a lot about Jamberry lately, and I’ve seen the decorative chevron around. Maybe I’ll get creative with my nails soon! I love what you did with your nails. I especially love the sparkling polish. It’s so cute. The Jamberry wrap intrigues me. I think I’ll have to try it out. I’ve been a bit obsessed with chevron this summer. I have 3 dresses with a chevron pattern! Love your nails! I just ordered my first pair of Jamberry nails and I am so excited! I really hope they hold up for me as well as gel manicures do! How fun! I am totally going to start incorporating more fun designs into my nail routine! I’ve got to try those. They’re so much easier to maintain than my normal chipping polish. Jamberry nails are just so cute. I want some of the chevron print! I just hosted a Jamberry party! I love them! My toes are currently black and white polka dot! I have never done Jamberry I have to say… maybe I should try it as I can NEVER paint my own nails without smudging them! Your manicure came out beautifully. Love the chevron nails are fabulous. I want to try this out now. I do love Jamberry nail wraps too! They last awhile when put on correctly. Very pretty look. I just started getting into jamberry, and I need to try this look!